Myiagra longicauda Swainson, 1838, Senegal. Two subspecies. Sometimes considered a superspecies with the white-tailed blue flycatcher (E. albicauda). English: Blue flycatcher, northern fairy flycatcher; French: Gobemouche bleu; German: Türkis Elminie; Spanish: Eliminia Azul. Male is cobalt blue above and on the throat, paler below, with a long tail. Females and immatures are grayer, with a narrow band of blue on edges of wing and tail-feathers. 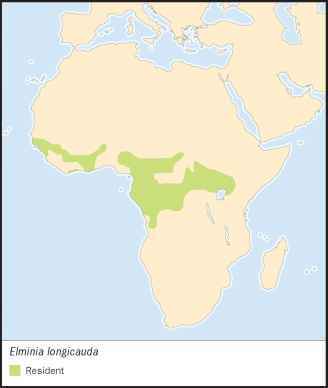 The widest distribution of the Elminia flycatchers, from the Atlantic coast of West Africa to Lake Victoria in the east. There are apparent gaps in its distribution, but this probably reflects a lack of human knowledge, even of such a colorful bird. Resident in woodlands, from sea-level plains to 7,200 ft (2,400 m), inhabits clearings and edges of open secondary forest, swampy or riverine forests, and wooded savannas. Also found in cleared and abandoned fruit and cocoa plantations. Live at lower altitudes than the similar white-tailed blue flycatcher in most places. 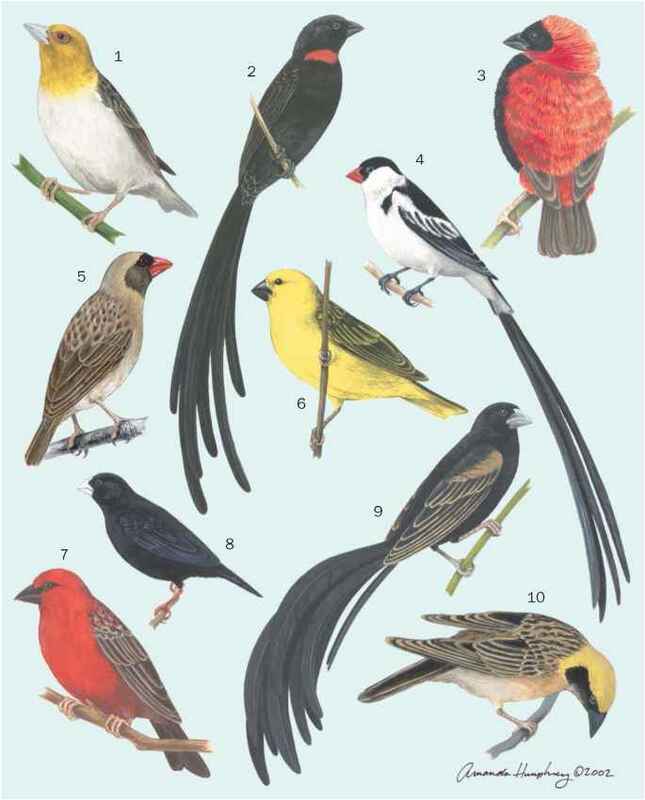 Live in groups of up to 12, but usually 3-7 birds. Largest groups comprise several pairs or trios of adults with immatures or dependent young. A 'leader' defends the territory, singing frequently, with its crest erect, wings flicking and tail fanned. Always on the move, picking small insects from the foliage in the top of trees and shrubs. Sometimes fly from a perch, catch a flying insect, and return to the branch, in true flycatcher fashion. Appear to be monogamous, though some may be polygamous. Female lays and incubates one or two white eggs in a compact, cup-shaped nest. Both birds in the pair feed the young, with assistance from nonbreeding adults or immatures in the group. Relatively common in good quality habitat, although endemic and breeding at a relatively low density.